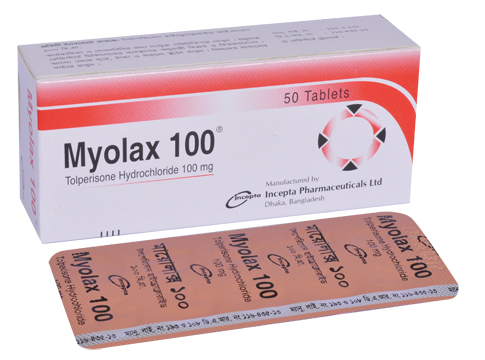 Myolax 50: Each film coated tablet contains Tolperisone Hydrochloride INN 50 mg.
Myolax 100 : Each film coated tablet contains Tolperisone Hydrochloride INN 100 mg.
Tolperisone Hydrochloride is a centrally acting muscle relaxant. It effectively reduces muscular hypertonicity, improves peripheral blood flow by vasodilatation and reduces pain. 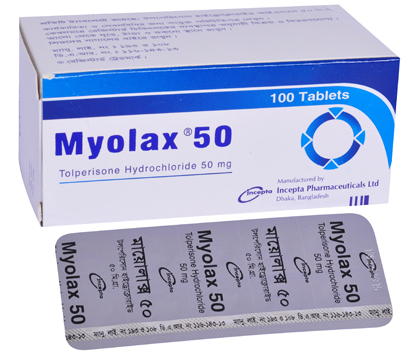 Adult: 50-150 mg three times daily according to the individual requirement and tolerance of the patient.